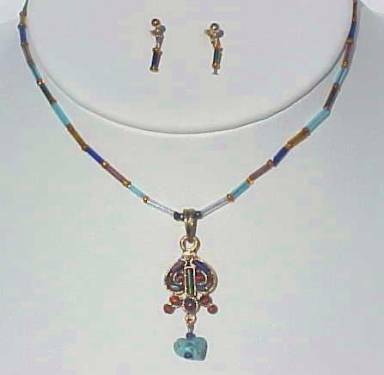 This necklace, which adjusts from 14" to 17", is made of multicolor bugle beads. The center piece is made of brass, inlaid with gem-like translucent enamel. The picture doesn't begin to do justice to the intense colors and jewel tones! Very exotic, and very flattering. The set comes on a card in a recloseable plastic bag that has been opened only to add a price tag. 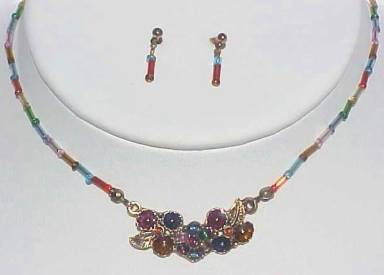 This set is made of multicolor bugle beads, perfectly matched - those on one side of the center piece match those on the other side. It adjusts from about 14" to about 17" long. 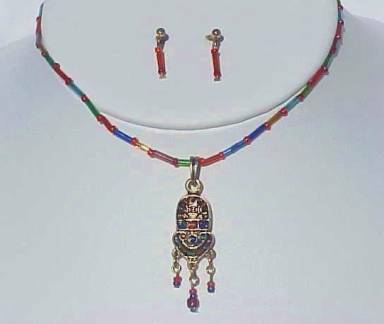 The center piece is made of brass, inlaid with translucent, gemlike enamel - the photo doesn't do justice to the intense, jewel tones - with a turquoise drop (Real? I think so). Drop earrings are included. The set is comes on a card in a recloseble plastic bag that has been opened only to add a price tag. This lovely necklace is made of bugle beads, perfectly matched - those on one side of the floral center piece match those on the other side. The center piece is made of brass and gemlike translucent enamel. The picture doesn't begin to show the depth and brilliance of the jewel tones! Drop earrings are included. The set comes on a card in a recloseable plastic bag that has been opened to add a price tag.